MANILA, Philippines — The Bureau of Internal Revenue (BIR) is planning to audit the income taxes that were withheld and remitted by Philippine offshore gaming operators (POGOs) for their foreign workers, a top official of the agency said. In an interview, Internal Revenue Deputy Commissioner Arnel Guballa said the agency is planning to counter-check the taxes remitted by POGOs as against the actual income being earned by their foreign employees. “We have not yet validated. Some of (these POGOs) have remittances but we will check if they are correct. We are counter-checking the income that they (foreign workers) receive,” Guballa told reporters. The government is strengthening the monitoring of foreign workers employed by POGOs to ensure that they are paying the correct taxes. In line with this, the government has formed an inter-agency task force. Earlier, the BIR said it came across reports in China stating that foreign workers in POGOs receive an average of 10,000 yuan, equivalent to about $1,500 or P78,000, a month. However, Finance Secretary Carlos Dominguez said the salaries reported by foreign POGO employees were only at around P20,000 each month, which was “ridiculously low” for skilled alien workers. DOF estimates also showed that the government still stands to collect P32 billion in income taxes annually from some 138,000 workers of offshore gaming operators. According to Guballa, the inter-agency task force is now finalizing the list of foreign POGO workers. He said the government has also included in their monitoring foreign workers in other industries, and those working in special economic zones. � “We expanded the coverage for all foreigners…such as those in economic zones like Clark and Subic, the consultants, engineers,” he said. 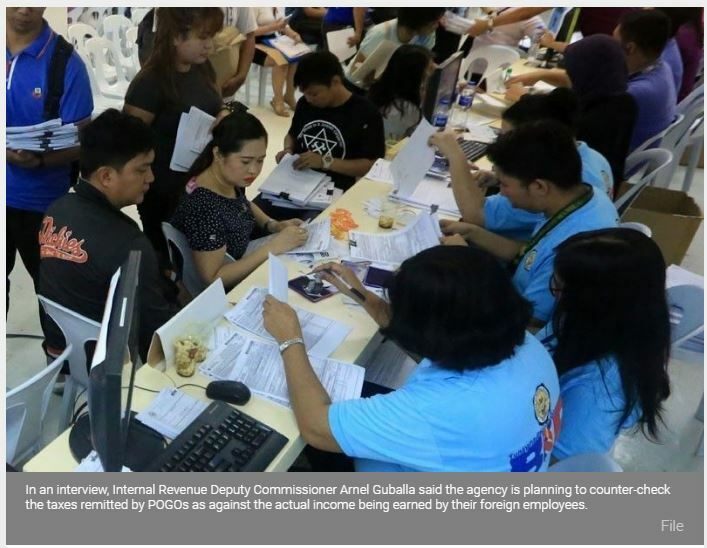 To ensure the proper collection of taxes from POGOs, Guballa said the Department of Labor and Employment (DOLE) will now require these workers to get a Tax Identification Number from the BIR before they will be given special working permits. Guballa said POGOs which are not registered with the BIR would be imposed with the necessary penalties. Meanwhile, the BIR yesterday issued Revenue Regulation 5-2019, which provides tax incentives to green enterprises duly registered with the Climate Change Commission.